Weather: high 4 celsius, low -1. Mostly cloudy until mid-afternoon, then wet snow that changed to rain -- 6mm of rain overnight. 10.30 a.m. Two workers preparing the rink -- one shoveling snow mixed with leaves away from the boards, the other pushing snow off the hockey pad with his truck. 11.00 a.m. workers gone (for lunch?) They returned around 1 p.m. but just waited in the truck and then said they had to go up to another rink. They said that a street sweeper would come on Tuesday, to clear off the leaves. Recreation staff were moving the last few rubber mats, rink shovels and two shinny hockey nets out of the compressor room. The Parks rink supervisor had sent a message that these items were a safety hazard for his tech crew: the increasingly strange use of the Ontario Health and Safety Act. In the old days, which really did exist I hope, the tech crew would have asked the rec staff to store them in the corner where they wouldn't be in the way. On the plus side, the mechanics say that all the city's zambonis are tuned up and ready to go, in the main garage downtown. Weather: high 5 celsius, low 1. The rain overnight washed all the snow away. 10.50 a.m. no sign or workers or street sweepers yet. Lots of leaves and dirt. 1 p.m. The street sweeper came. It didn't hit every spot but it's better. Hopefully the crew will clean it some more when they begin laying down the water tomorrow. There are so many people calling and coming by the rink now, to check on the opening day. And the rec staff are running between four rinks, trying to get everything ready and sharpening the rental skates with the new machine. Weather: high 2 celsius, low 0. A few rain showers mixed with wet snow, but no accumulation. 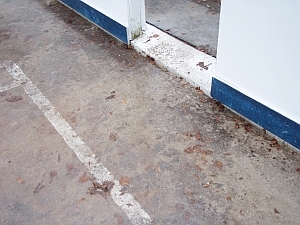 The compressors were turned on but the rink still has dirt patches and leaves. There may have been some more cleaning today but none after 1 pm. At 8 pm the rink is icing up, and the nets, still out there, are frozen into the rime, along with the leaves and the dirt. Weather: heavy clouds with the occasional lighter moment. High 3 celsius, low 1. About 5 workers came at 7 to begin putting water on the rink. before they began, they cleaned up a bit more and got the nets unstuck. After a while there were only 2. 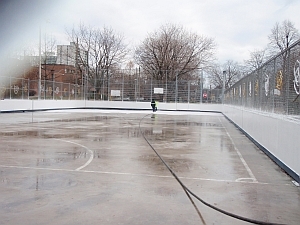 They sprayed the rink until 1.15 when they had to leave to go back downtown to sign out. The ice still has dirt on it, even though it's better than before. The dirt next to the south-facing boards is worrisome, since that's where the sun will thaw first in late winter. Dirt makes dark patches, much easier for the sun to thaw. Weather: heavy clouds, a few short bits of rain. High 4 celsius, low -1. Five workers back down to two doing the hoses. We heard that no afternoon shift was booked to keep flooding. The zamboni arrived but was not used yet. One of the workers was pessimistic about ice being ready. Another one was optimistic. earliest shinny hockey players 9.30 a.m. Weather: High 5 celsius, low -2. Cloudy with occasional faint sun. The rink opened, and despite the crush of people skating, and staff having to put pylons up (and one trip-and-fall on a cement patch) the rink stayed open. Ice maintenance staffing is still not settled. At one point in the afternoon, there were suddenly three rink operators instead of one. When a broken hockey net was pointed out to the senior worker, he said that he was not actually in the program, he was only there as a favour (he didn't mention, to whom) and therefore he had no reason to make sure the net was repaired. No foreperson or supervisor came by. The zamboni dumped the snow in various places that will be hard to clean up. 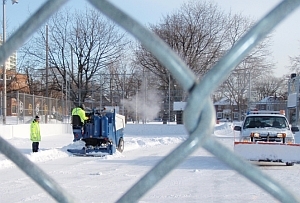 In the evening, one zamboni operator refused to clean the ten feet of ice at the east end of the pleasure rink because he was afraid he would hit the railing at the edge. Start-up problems! But hopefully they will soon be ironed out. Window-smashing story: Last April, soon after the end of the rink season, the windows of the rink house were smashed four different times within two weeks. That has never happened before at this rink. It probably cost the city over $2000 to do all the repairs to the large, heavy-duty windows. After the third time, a park neighbour began to keep a bit of a look-out. On a Sunday afternoon, the neighbour heard the sound of breaking glass and looked out his upstairs window. He saw three boys, two of them quite short, with an iron bar. So he ran down his stairs and over to the rink. The boys took off. The neighbor followed them, trying not to be seen, and called me (Jutta) on his cellphone. The boys doubled back to fetch the skateboard one of them had forgotten. By then I had got there on my bike. The neighbour showed me the kids, but they took off again and spread out, and I couldn't catch them, even on my bike. But I saw their faces. Today two of those window-smashing boys came back to the rink, hoping to skate. Over the next hour, a little drama played out, as I identified the boys to the staff and we watched them, and they alternately tried to make themselves invisible or to act unconcerned. The staff called the police. Even before the policeman got there, the boys' story began to unravel. It emerged that the boys had solid families who were interested in collaborating on what to do about these young vandals, and contact was made. For now, the policeman gave the boys Trespass Orders, and the staff are setting up a meeting between the boys, their families, and Tino DeCastro, the Recreation supervisor. The aim is to get the boys to do community hours at the rink, so they can earn their way back into a place where they desperately want to be, and where their friends are. The extra benefit is the boys' exposure to the recreation staff as they work under their supervision. They need some guidance, and from this excellent staff, they can get it. Other rink users can help as well. 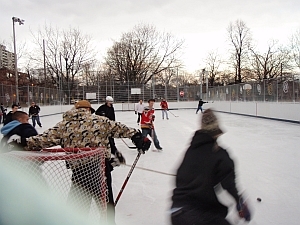 That's one of the very good things about having a neighbourhood rink. Weather: High 3 celsius, low 1. Cloudy most of the day, with a strong wind and mixed snow/rain beginning about 3 pm. 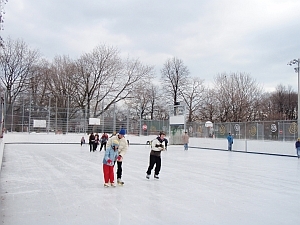 Despite a "winter storm warning" in the weather forecast, lots of skaters came to the rink, and even kept on skating when the rain began. The warming fire in the woodstove and Mary Sylwester's spicy farmers' market soup helped out when the chill began to sink in too deep. The zamboni has a defective blade so it couldn't scrape the ice very well. 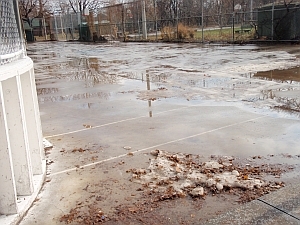 The mixed snow turned to just rain, covering the ice with water -- but there were a lot of bumps. Weather: high 3 celsius, low 1. Rain-showers for much of the day, but by mid-evening there were a lot of kids playing shinny, not so many pleasure-skaters. 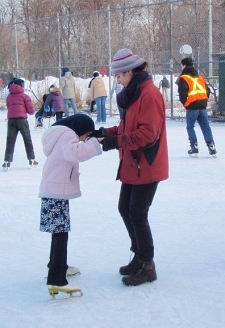 There was lots of friendly back-patting of people just returning since the rink opened. A guy fell on the path, before he even got on the ice, and he figured he's twisted his ankle so that it might be broken. He lay out there on the cold rubber mats for 20 minutes until the ambulance came. This kind of injury -- just slipping on sidewalk ice (it was raining at the time) is far more common than slipping and falling while skating. A new zamboni driver was practising and he was frustrated tonight. He was just told to go to the rink, without being given any specific orientation by someone who came with him. He said he wouldn't have minded only two hours with an old hand, just even to be shown the tricks to opening the various gates. No foreperson, no trainer, no supervisor on site. Odd. Weather: High 3 celsius, low - 2. Cloudy with occasional short snowflurries. 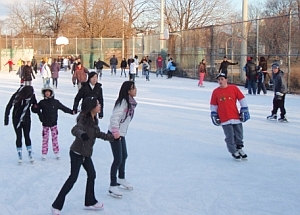 The rink was very busy all day -- lots of school kids and also shift workers. Lily Weston, who used to work here ten years ago, has returned for two evening shifts a week. She says she can't believe the change -- no arguments! The culture has changed over the years -- where the strongest and pushiest used to be on top, now everybody takes a turn. The atmosphere is so much more friendly and relaxed, and usage has gone up too. The new zamboni driver is getting the hang of his big blue vehicle and figuring out his own tricks for getting around the tight pleasure-skating rink. He did so much better on his early-evening round, the Rec staff came out and shook his hand -- "congratulations!" He laughed. Learning to drive that zamboni with an audience of fifty young guys who know everything better must be tricky. Now if the ragged nets can be fixed up, even better. Weather: weak sunshine off and on, high 5 celsius low 2. Light rain starting around 9 pm. The nets didn't get fixed but that didn't keep skaters away. At 7 pm there were 50 guys trying to play shinny hockey. The pleasure-skating side had the overflow, and the inside was crowded too. The rec staff are talking about having to cap the numbers and turn people away. And on Friday there's a school holiday -- how can all those kids fit? The crazy thing is that there are so many other rinks around here. 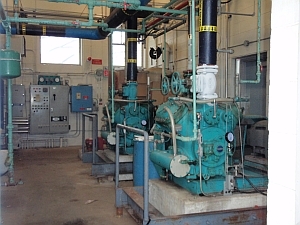 Their compressors have been on for days, using up lots of power, but they need some more flooding and, in these long evenings with early darkness, they need the lights turned on. The reason they're not open is that the official schedule says no more rinks can open until December 6. 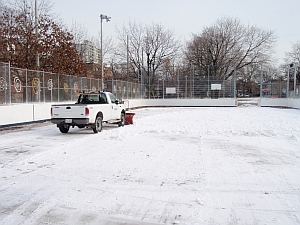 According to a report that Parks staff presented to the City councillors last month, this is training week, so there should be lots of zamboni drivers around, who need practice and could be flooding these rinks. 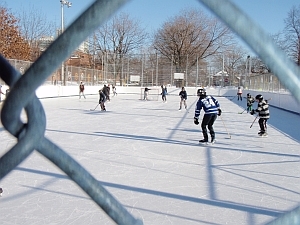 That same Parks report says Dufferin Rink is a designated training area. But we've seen almost no one being trained. So where are they all? 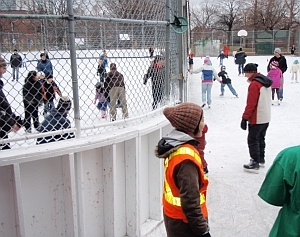 It's been ten years now that we've been writing to Parks management and to city councillors about opening up the rinks when the season is ready, to let the crush of young people skate and play shinny hockey. 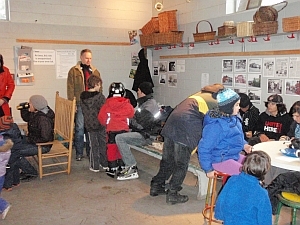 Tonight the kids were talking to me in the rink house, saying, why don't the Dufferin staff get the other rinks open? We can't move out there! I said, the recreation staff have no control over this. The rinks are controlled by another arm of the department, by Parks, and they are in their own silo and do as they please. But you guys don't even know the power you have. If all forty of you in here took out your cell phones and called your councillors, you could change people's minds. They obviously think I'm soft in the head. One of them said, Miss, I voted in the last election, and nothing happened. Why would I call those councillors? I bet there are meetings scheduled from here into the next decade, about how to deal with fat kids, bad hearts, high blood pressure, juvenile diabetes. And here they all are, kids wanting to skate, packed in like sardines at Dufferin Rink and locked out of those other rinks which already have their power running. But there seems to be nobody with the will to lay down the water and turn on the lights. In other news: the annual December shoe thief is back again, stealing old, ordinary shoes so that little kids, and adults too, will have to walk home in skates or in their socks. Tonight the lead staff lent her spare boots to a women whose shoes were gone, so she could get home. The woman couldn't believe that the staff would do that. The lead staff said -- why not? I can go home in my work boots, and you can give me back my other boots tomorrow. Meantime, the annual "caution, shoe thief" signs will have to go up on the door again. Weather: High of 5 celsius, low -5. A few short flurries but mostly weak sun or cloud. Market day madness -- when the rink house is filled with farmers and skaters, on Thursday Farmers' market day. The new zamboni driver was pretty accomodating to the hubbub -- he has obviously been warned that this mixed-use is the reality of Dufferin Rink. The biggest headache for the rec staff is the 13 to 17 shinny hockey age cut-off. Some of those fellows are very good, and the age cut-off is an arbitrary way of cutting the numbers into different time slots. So the borderline kids pretend to be over 18 or under 18 depending on the scheduled time. Staff have put up signs that i.d. will be required, but it's not so easy to insist. A lot of time is spent in argument at the rink gate. Ten years ago, the argument would have quickly become abuse, especially because most of the rec staff are women. But by now there have been so many examples of the rec staff's willingness to make their points stick -- and so many signs that the rec staff are struggling to make the rink work for the shinny players -- that there is rarely any abuse. Just diplomacy and strategy, waiting for the moment to sneak on. Another kind of game. 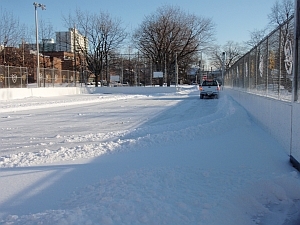 It's important to remember that much of this will improve when the other rinks open tomorrow. One of the window-smashing kids from last April came to the door at 9 om. The meeting with his family has not yet been set up. He asked -- am I allowed to play after 9? The staff said -- no, of course not. He will try at other rinks too, innocently -- in a way -- a child of 13 not fully taking in that if you smash windows, you are labelled, and for good reason. You can't recede, becoming just one of the group. Weather: high -4 celsius, low -8. mainly sunny but the sun is so low and weak you hardly notice it. Today was a day off for many schools and the rink was pretty crazy -- since most of the rinks are not yet open, at least not officially. Beyond the crowding from the younger kids, there are all the young teens who come skating to be with other young teens, play-fighting and bragging and doing various girl/boy dramatics. Friday night is a particular focus -- too young to date, maybe, but old enough to see and be seen, as noisily as possible. The park cooks made some delicious food for the Friday Night meal, but eating it in the rinkhouse was a bit like eating in a noisy kindergarten. It reminded us why Friday Night Supper was started in the first place -- to balance the youth culture with some adults. When it got too crowded, Friday Night Supper devolved into less of a sit-down thing. It may need reviving, to squeeze the youth a bit, so they don't feel that they own the whole world. Weather: High minus 2 celsius, low -7. Snowflurries beginning about 1, more in earnest about 3 pm. 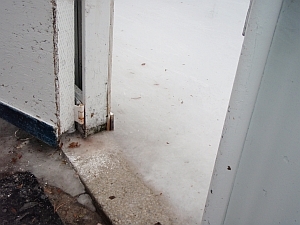 The accumulation was only about 2cm, but it always builds up faster on ice. The crush on the rink was much relieved by the opening of Wallace, Christie, and Campbell rinks nearby, but even so there were lots of people out to skate. In late afternoon, when the snowflurries had begun to build up on the ice, the staff took the pucks off and gave the players a fluorescent tennis ball -- so that no pucks would get lost that could then be sucked up by the zamboni. If a puck gets up into the zamboni's augur, that means three days in the mechanic shop down on Eastern Avenue. At 5.15 the snowflurries had backed off quite a bit and the zamboni cleared off the snow pretty quickly. As soon as it was back in the garage and the driver was gone, the next flurry came. Then it stopped again, and the rink rats plus rink staff went out with the green rink shovels and got the shinny side clear again. Good hockey for a while after that. The next snow cleared the rink out, though -- a winter wonderland, but better for a walk in the park than for finding a buried puck. Weather: high -6, low -12. Flurries later in the afternoon and evening. Snowflurries and cold kept people inside by the woodstove a good deal. The permits came, though, and had a good time despite the cold. Weather: high -3 celsius, low -11 (earlier). Lots of schoolkids during the day. 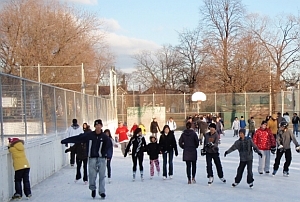 At about 4 pm, rec staff discovered that someone had stolen the skate lending money of about $50 plus three $50 deposits left by skaters instead of i.d. It turns out that the newer staff had noticed that someone had stuck a pen in the skateroom door so the door wouldn't close properly. He kicked it out, but by then it must have been too late. The rink has had money stolen in the first week almost every year of its operation. Do crooks plan this all out in September? So now everyone is on alert, and checking the skateroom door neurotically to make sure it's locked. The skate-rental money is supposed to pay for the new skate-sharpening machine. It's annoying to think it's in somebody's pocket instead, although there is a bit of amazement at the skill of the crooks. Weather: High 5 celsius, low -1. It rained almost all day. 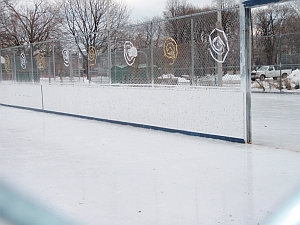 Even so, there was a steady dribble of skaters, but the women's shinny program cancelled. Weather: High 3 celsius in the early morning, then it cleared and the temperature dropped down to -9 as the day went on. Beautiful full moon over the rink. Lots of skaters in the evening, shinny players especially but also people just skating around on the pleasure-skating side. Weather: High -2, low -5. Some faint sun, and again that beautiful moon over the rink. Market day, but this one was less chaotic. Part of what makes market day tricky is the profusion of babies, some in big strollers that make it seem even more crowded in the rinkhouse. There is no problem with population replacement in this neighbourood. The Parks supervisor came to oversee the arrangements for the zamboni to fill its water tank during market time, when it can't get into the garage. People are forever looking for the rules, for the system that can lay out the correct procedure -- but in the end, friendly cooperation really makes or breaks a rink. The rink program staff are bending over backwards to make things work. And Chris, the new zamboni operator, is getting good at ice maintenance even though he's so new at it. Tonight's older men's neighbourhood shinny permit players said he laid down a perfect sheet of ice for them, and they had a lovely game. Near the end of the evening, rink staff made ten guys leave, for being drunk on the shinny ice. They did leave, even though with threats to come back and be obnoxious again on another day. Weather: High -3, low -10. Mainly cloudy with a few weak streaks of blue; short light snowflurries. Friday Night Supper was bigger than last week, and one long table was set up. The menu: Boeuf Bourgoignon, coconut vegan curry, beet and green salads, mashed rutabaga, and apple pie with ice cream for desert. Half the people ate in skates. A group called "Meet Market" came for their monthly visit, and they rented skates, had some dinner, and then made a campfire at the side of the rink. The rink house was very active with the younger teens, who rent skates and socialize and are really pretty nice. The more there is a mix of ages, the better is the mood of the rink house. One of the loudmouth troublemakers from last week held open a door for a skater. I asked him, "is it my imagination, or are you already getting nicer?" He took a minute to consider it, and said, "I'm getting nicer." Weather: High plus 2, low minus 12. Mostly cloudy with here and there a little sun. Light snowflurries beginning about 8 pm. Saturday is a day of lots of little-kids' shinny hockey. Today it was packed. First it was 12 and under from 12 to 1.30, then it was 9 and under from 1.30 to 3 (both with parent or - in a pinch -- a cousin). 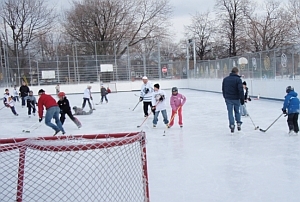 With so many little skaters, surely Dufferin Rink will send someone to the NHL some day. In the afternoon there were too many people, everything was crowded. This is the result of rental skates, in part -- so many new people come and rent the $2 skates, including lots of youth, and then they have to be stopped from racing around the ice and bumping into people. One very nice thing: new park friends from R.V.Burgess Park in the Thorncliffe Park area came to the rink to check it out for the Thorncliffe Park Women's Committee. They had a look at everything in the park, and the three kids who had come with the group, got some loaner skates and practised skating. There was time for some good Zamboni cafe food and conversation. One of the women came from Kabul in Afghanistan, and she described an overn they used to bake in while she was at university, working at a summer job. She was very enthusiastic about cooking over fire, and making tea, and the possibility of picnics where food could be prepared in such an oven. 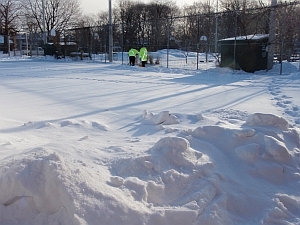 Perhaps the Dufferin Rec staff will help them put together a winter campfire at R.V.Burgess Park. At closing time a young man and woman came to return their rental skates. They said they are German, and are here doing graduate work in philosophy at the University of Toronto. The rink staff person taking the skates was curious, and the young man explained a bit about his study of Aristotle. The rink staff said she actually preferred Heidegger, and gave her reasons. Will these German students go back to Germany saying that in Canada, skate lending is usually combined with philosophy? Weather: high 5 celsius, low 5. Off and on rain showers or mist. Raw. The annual craft fair set up in front of the rink house today and the vendors froze but got lots of buyers -- good crafts and not very pricey. 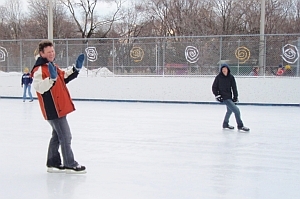 On the rink, skaters came despite the wet, but not so many as yesterday. Weather: high 9 celsius in the morning, and raining, then it dropped down to -7 by evening. The zamboni cleared off the water in the morning, then it rained again, then there was a long time before the next ice maintenance. The Italian card players had a peaceful time in the abnormally quiet rink house during the afternoon. But they complained that it was too cold. They tried to start a fire in the woodstove but there wasn't enough kindling. They were unenthusiastic about suggestions that they could bring kindling from home, to supply the rink woodstove beside which they play cards five days a week. Apparently most of the card players strongly believe that since they are retired, others should do such things for them. 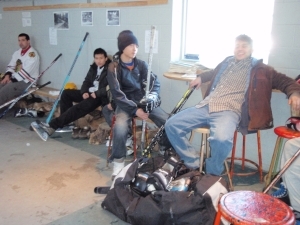 Some school classes came in the afternoon, and by evening, the older shinny players had come. So there were lively games -- on both sides after 9. Weather: high -3 celsius, low -4. Snow began around 9 pm. The rink is having more school visits than last year -- the rental skates are a draw. Busy in the evening, and even after the snow began, the shinny players carried on, on both sides. They finally declared it over at about 10.30 when the snow made it hard to even see the puck, even harder to move it. 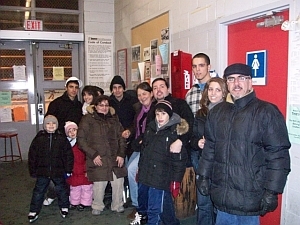 At about 6.00, some skaters reported their shoes stolen, and they pointed to a group that was leaving the rink quickly. The rec staff followed them and one of them dropped the shoes. This may be the shoe thief -- a guy familiar to most of the rec staff and certainly not returning. It's just necessary to wait for him so he can be pointed out to all the staff and none overlook him if he tries to come back. The guy is a known smart-aleck. The shoes were never valuable, he must have just thought it was a great prank. Weather: High minus 3 celsius, low minus 7. It snowed 2- 3 inches but the rink didn't get cleared until after 1 pm. The other nearby rinks were much worse. The guy who was caught with the shoes says he didn't steal them, that when the kids who stole them saw the staff coming after them, they stuck them in his hand. He's a smart-aleck who gets on the wrong side of the staff but he may be telling the truth. So he's being allowed back. He says he'll point out the people who did the shoe thefts, but only if he can do it so they don't know he fingered them, otherwise they'll beat him up bad. All this happens in a setting of so much friendly sociability, little kids practising their skating, jokes told at the market tables. Layers of reality. The permit group -- the local old-timers -- said the ice was really fine again, and the forecasted storm didn't start until after the rink closed. Weather: High -12 celsius and low -18, about 20 cm of snow, lots of wind blowing the snow around too. Snow storm all day -- no skating. The ice maintenance crew went away mid-morning but the rec staff shovelled out all the paths, to be ready for tomorrow. The snow stopped during the evening. Weather: High -10 celsius, low -17. Mainly sunny. There were snowflurries in the night but they didn't amount to much. At 9 a.m. a plow-truck came, plus three staff worked on shovelling out the boards. Then one of them, the zamboni driver, got out the zamboni and tried to help, but he got the zamboni stuck in deep snow almost right away. It took a while to get the zamboni unstuck, and then the plow-truck kept on clearing the hockey rink. When it was done he moved to the pleasure-skating pad but he didn't want the zamboni to resurface the hockey ice until he was completely done on both pads. 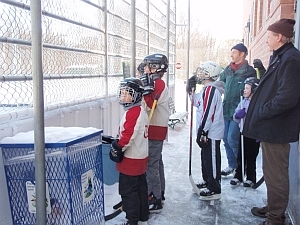 By the (about noon) there were a lot of people waiting to skate (parent-and-child shinny hockey time). They could see that the hockey ice was ready, and they were frustrated that they weren't being let on. After some negotiation between program staff and the maintenance supervisor, the zamboni was allowed on the hockey pad and resurfaced it. Happy skaters were then let on (around 1 pm) Then the zamboni drove onto the pleasure skating pad, apparently trying to work in tandem with the plow-truck. It was a bit of a cliffhanger to watch, since it several times seemed that the vehicles might collide. But they didn't, and both rinks were open by 2.30 pm. More snow began around 8.30 pm. Ice maintenance summary: on site at 9am, done a bit after 1pm, returned to do a second maintenance at 9:15-9:30pm. Weather: High -3, low -13. Some heavy flurries in mid-day. More snow had fallen overnight, so the ice was snow-covered. The zamboni began clearing the snow on the hockey side at 9 a.m. That was, of course, very slow going, and the zamboni ran out of fuel at about 11.30 with the pleasure-skating side not done. No plow ever came. The natural gas fuel tanks at local rinks are not under much pressure, for safety reasons, so it takes many hours to refuel. That meant the rink was only skateable on one side until 6pm. Ice maintenance summary: 9am zamboni and 2 drivers hockey side only then ran out of fuel. Then hockey side only around 1pm (with just zamboni). Then both pads around 4:30pm. Finished pleasure-skating pad around 6pm, no maintenance after that. Weather: High -7, low -13. Sunny much of the day, some flurries in the early evening and then clear. Holiday crowds today, big jam of people renting skates, way too many people on the all-ages hockey time. 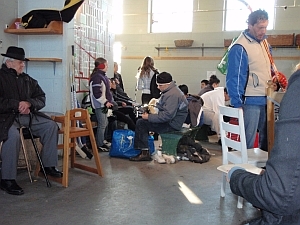 The rink is such an intense social space too, for so many different generations. The loudest are the mid-teens, and some of them forget their manners and get pitched out for the day. But so much of the back-and-forth is good-natured. There are sledders, too, coming into the rink house for hot chocolate, red-cheeked from an hour of sliding down the little hill by the Dufferin Hollow. In the evening there's good shinny hockey and tonight, because it's Monday, the only full-equipment permit. The group calls itself "Dufferin Groove." Some of them are engineers. They play music in a garage in the summer, hence the name. One of their goalies came inside at the end of their permit time, when the lights turned off, and said -- "that was too good. That was just the greatest. There's nothing better than playing outside like that." He must have played hard, because he had some sweat icicles in his hair where his helmet had been. Beside the rink the snow piles are enormous. The loader must have been here, and pushed back the snow into big new mountains, to make room for the next load. There's a wide snow road going through the park, and this year for the first time the snow crew have made another wide path along the rink where everyone walks. Very civilized -- skaters don't have to pick their way through the snowdrifts any more, to get into the rink from the east. Weather: High -2, from a morning low of -10. The temperature rose throughout the day. Light snow from 3 to 7, then a break, then more light snow. There was an extra pre-Christmas farmers' market today, because this year the regular Thursday market days fall on Christmas Day and New Year's Day. By the time the market set up, it was already snowing, and not many people came. The farmers were good sports about it, but they were glad to pack up and go home before the forecasted ice rain began. The fan belt broke on the condenser -- it made a clacking noise and then it was eerily silent. The Tech Services staff guy came from home when it almost dark, and climbed up to the roof and replaced the belt. Hurray for Tech Services guys who drive through snow and sleet to fix fan belts! But then came more trouble. Because of the snow on the ice, the rink staff missed seeing a puck buried in the snow when the zamboni went out to resurface, and the zamboni swallowed it up the augur. Damn. That will be three days in the service garage, maybe. Or longer, because of Christmas. After that, the foreman just used the plow-truck to get the snow off. Maybe the maintenance staff will eventually work out a regime that always brings the plow truck on before the zamboni when there's been snow. But given the experience of the past few snowy days, it may be that those plows are in short supply. "I've got another $200 for you for the last 3 months. Dufferin Grove residents who have used buyingblock.com. What would you like me to do with the money? Also, so you know we now have created a group fundraising feature. People add their names to a group and the group gets dollars. Check it out. http://www.buyingblock.com/groups.php. For every new mortgage, mortgage renewal and real estate transaction, $$$ go to groups and charities." Last year Bruce brought in four boxes of kids' skates that he had bought on sale at Canadian Tire, with that money. You never know where gifts will come from. Weather: high 5, low -3. Heavy rain for a while in the afternoon. In the evening it cleared off amid very strong winds. Two plows and two zambonis worked on the rink to get it clear in the morning. Apparently a couple of old-hand zamboni drivers had managed to get the jammed puck out of the augur without taking the zamboni to the shop. Still, that zamboni was sticking a lot with the heavy snow, and the driver was fairly fed up, having to go into the garage so often to rinse it out. Despite the balky zamboni, the rink was open by noon and there were a few good hours for parents to "run their kids" so they'd sleep tonight despite the big excitement coming on Christmas morning, for those who celebrate Christmas. 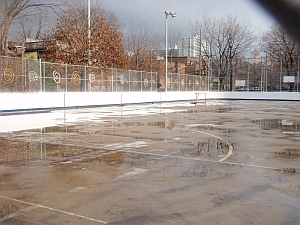 But by mid-afternoon the rain started coming down heavy, and the staff closed the rink early. Weather: sunny, high 0, low -8. 10 a.m.: the first skaters have straggled in, some with new skates. Last night's rain turned the ice into a beautiful smooth sheet, so it's no problem that no ice maintenance staff are scheduled for today. All the skaters are smiling. 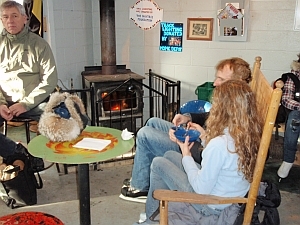 Inside the rink clubhouse, the coffee is on and staff are just lighting a fire in the woodstove. By early afternoon there are lots of skaters at the rink, all of them cheerful. 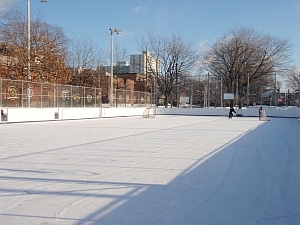 It's sunny, the ice is still okay despite the lack of resurfacing, and it's Christmas -- plenty to be cheerful about! Weather: high 3, low -4 (n the morning -- then rose in the evening). Snow in the morning, then cloudy. The zamboni worked a lot of the morning, because snow was falling. The snow stopped around noon, and then the ice got better. Steady but not crowded today. Weather: high 9, low 9. A lot of fog, showers in the morning, a few periods of drizzle in the afternoon and evening. The ice had no maintenance at all. The morning shift zamboni operator came by and said that if he went on the ice, the zamboni would gouge it. He seemed to think that the idea of a zamboni taking up water was kooky. In the afternoon there was no evidence of any zamboni driver and the supervisor's pager was turned off. The ice is high enough already that with all this rain freezing onto it, there will soon be a problem with ice thickness again, as in rainy winters of the past. At 9 pm the ice had dried up on its own (still 9 degrees, but the rain from the earlier showers had frozen onto the ice) and there was a shinny game going on, plus some pleasure-skaters. Weather: mild and rainy high of 9 in the morning, then high winds and the temperature dropped to 3 in the afternoon. The zamboni driver said that when he came to resurface the ice early in the morning it was hard, so he flooded it! After all that rain. Then later ion the morning he was reluctant to go on again, in case the water on the rink (after the final morning rainshower) was actually from the ice melting. A tricky bit of negotiation, not "giving direction" but trying to explain that the zamboni can take off the water, and that it's important to keep scraping the ice so it doesn't get too high. When he heard about the way that Rennie Rink staff maintained their ice yesterday, so that it was skateable when the other rinks were full of water, the driver said that everyone has their own way. But he agreed to go out with the zamboni and afterwards the ice was much better. The skaters said it was as smooth as they've ever seen it, and they looked very happy gliding along. The fact is, the ice is over 3 inches in places and we may be heading toward the same thick-ice crisis we had three years ago. So hopefully we can persuade the maintenance people to do the ice like at Rennie. The morning zamboni operator did two resurfacings on his 8-hour shift: first around 9am or earlier, he did a scrape and flood (despite the rain yesterday). Then at 12 noon he did a scrape. The afternoon operator did two resurfacings on his 8-hour shift: a scrape at 5 pm and another scrape at 8pm. Weather: High 3, low -3. Winds up to 80 km an hour in the evening, a few snowflurries mixed with rain. The rink was crazy busy today. We had all thought that maybe people had given up skating, but it turns out they've only given up skating in iffy weather. So today the rink was swarming from morning until the gates were locked at 11 pm. - a Filipino family with three kids brought their in-laws from New Jersey, with four kids. They all rented skates, and they were so pleased that the dad drove back home and fetched four more cousins. The mom said that she had mentioned the possibility of skating at bedtime the day before, so the kids had been talking about nothing else since morning. One of the cousins said his skates were too big. But the other skates he had tried on were too small. A park friend heard the conversation and helped re-tie the laces tighter. After that the skates "worked perfectly" and the kid was glowing. - Neighbours skate round and round the rink, talking companionably to one another, two by two. I see people doing this, when I didn't even know that they knew each other. Maybe they only see one another during the daily school drop-off, but at the rink there's more time, while the kids play shinny hockey or skate around separately. It's an old and slow form of socializing, like priests walking back and forth under the colonnade at the Vatican. Today there were very few cell phones in evidence -- maybe it's possible to be at the rink with a bit less electronic updating. - The parent-child shinny had about thirty (or more) kids and parents, seven or more pucks. Yet when the hour and a half ended, players came off saying it was such a good game. 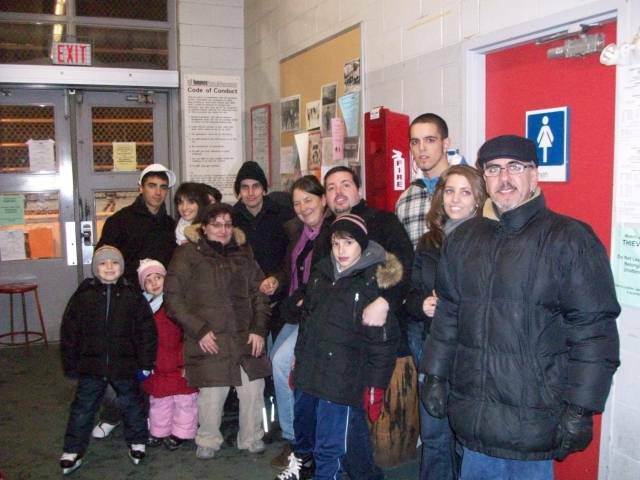 - Two parents arranged with the staff to pick up a little padlock key for the side gate, so they can come to the rink early in the mornings before they leave for work, to play shinny with their kids. The rink can't stay open at night, like those rinks without fences, because of the noise that bothers the rink neighbours at night. But it's simple to give rink friends a key so they can open the gate in the morning before the staff arrive. - Brazilian newcomers rent skates a lot, and they are often big groups with all different ages represented, up to grandparents. Same with the Tibetans. 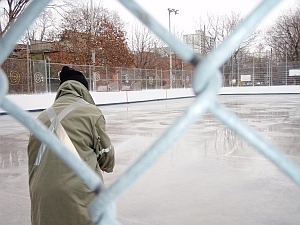 - A City staff from another area came by to check out how this rink runs. In her opinion, even though rink staff have collected enough skates to start a rental program for another rink, they should only rent them out for two hours on the weekend. The reason: staff should not be handling money ($2 per rental!). 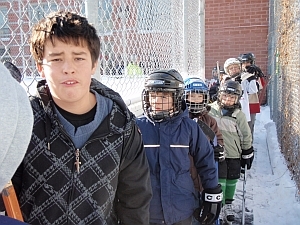 Such an artificial skate scarcity would affect school classes at Dufferin, where the teachers call in the skate sizes ahead of time, and the rink staff have them ready. It's an easy way for kids to get exercise and have fun (and the teachers often treat their kids to discounted hot chocolate and cookies). These school classes don't pay a rink permit fee, since they don't have exclusive use of the rink. But in the opinion of the "Strategic Development" staff downtown, all classes should be paying a fee. So the classes just don't come, and the rinks are often empty in the daytime. 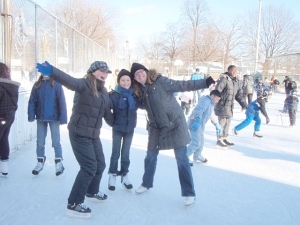 At Dufferin Rink, skate rentals for school classes are often free --another no-no, maybe. - During the evening over-18 adult shinny time, one of the players was observed to be quite drunk. The staff leader (a petite, gutsy young woman), told him to go home. He took off his skates and came over to her, waving his fists. Then threw the skates at her, saying "I'm gonna cut your face up." But his friend dragged him away. Another staff person called the police, saying "assault with a weapon." The police came fast, but by then the guy's friend had managed to drag him out of there. - Just before 11 pm, one of the shinny hockey players got a puck in the face. His lip bled profusely, and the staff came out with gauze. He waved them away, saying he wanted to take a picture of himself with his face all bloody. Then he whipped out his cellphone, to the great entertainment of his friends. The photo is probably up on Facebook now. 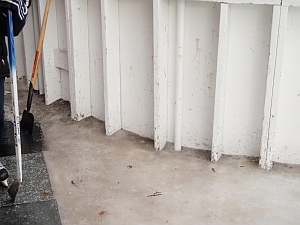 Ice maintenance today: 10am flood - augur jammed, ok by 11am; 3:45pm; 7pm; 8:55pm. Weather: high -3, low -8. Cloudy with sunny breaks, then snow starting at 9 p.m.
Another busy day today. Some shinny players (guys) came at 9 pm and they saw that there were only three women there for the women's open shinny program. They began to lobby to be allowed on the ice, and they were pretty unhappy to hear that women's shinny is not a permit that can be cancelled -- it's a program of women's shinny. One of the guys was particularly sure that he should be allowed on. There were still some little kids skating around on the "pond" rink pad right after 9. The new guy didn't think it was plausible that there would soon be a fast, thrilling game of shinny on that rink pad (as there is every night). He said -- I used to skate here before they even rebuilt the rink, more than fifteen years ago! But it was no go. The staff told him that the women's shinny program stays, no matter what. The guy took off his skates and got packed up and left. Ten minutes after he was gone, the women's shinny game had fifteen players in it, and there was a fast game on the pond side too, only slowed down by the snow that began to fall. The little kids had all gone home. So the guy missed seeing all that, and he didn't end up playing at his childhood rink. But there was no persuading him to wait and let the games unfold. Sad! Ice maintenance today: 9.15 am, 1.30 pm, 5.15 pm, 8.50 pm. The zamboni driver says he needs a sharper blade, that replacing the blade once every two weeks is not enough. Weather: Sunny much of the day, cold, high of -6, low -14. Windy in late afternoon. One brief snow-squall around 7 pm., then clear and calm. Lots of people out to skate, and really lots of fun in the evening -- lights went out at midnight. 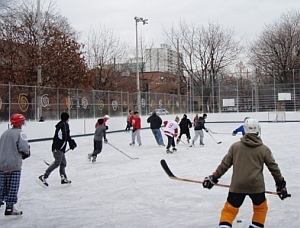 E-mail from Ross Fazio: I'm sending you a picture of the "anti new years eve party" clan.I stumbled on to the Dufferin Grove rink after becoming quite frustrated with the service or lack of from the many rinks closest to me, with three young children suffering from cabin fever, Dufferin Grove became the place to be, (even my six year old refuses to go to any other rink). Thanks again for remaining open on New Year's Eve when no one else would. Ice maintenance: Plow and zamboni to get overnight snow off the ice, 8 am. to 10 a.m. Zamboni 1 pm, 5.30 pm.